Another common question we aim to clear up is what the numbers on the labels of e-liquid (with nicotine) mean. When you see 6mg(0.6%), 12mg(1.2%), 18mg(1.8%) or 24mg(2.4%) those numbers represents the concentration, or strength, of nicotine in your e-liquid. It is measured in milligrams of nicotine per milliliter of e liquid (mg/ml) and often shortened to mg in you e-juice bottle. The strength can also be articulated as a percentage of nicotine by mass. To break it down in layman's terms 0mg of nicotine which would be best suited for weekend shisha smokers, who enjoys social vaping. 6mg of nicotine is a low/light concentration, which would be comparable to a Belmont Mild, Matinee or Du Maurier Extra Light cigarette smoker. 12mg of nicotine is medium strength that would be best suited for current smokers who smoke light to medium cigarettes like a Du Maurier, Player's or Belmont. 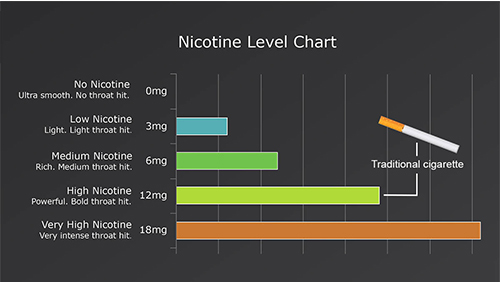 18mg of nicotine is considered strong for current Marlboro or Camel smokers and 24mg is very strong and it would be recommended for current heavy Player's Special smokers. If you are a heavy smoker, looking to get a high/strong level of nicotine fix then 18mg will be your best bet. Heavy vapers say that 18mg delivers enough nicotine for your cravings and produces a strong throat hit. Do you need a very high/strong level of nicotine and 18mg wasn’t enough? Then test out the extra strength 24 mg of nicotine. This is the highest mg of nicotine available in e liquid. We don’t typically advise testing this until you tried the 18mg, but as every vaper is different, you may prefer the 24 mg. Please note the type of device also helps determine the strength of nicotine that would best suit your needs. For example for vapers who enjoy a direct lung draw/sub-ohm (similar to shisha) you would probably want lower levels of nicotine. This is because in order to obtain a direct lung pull your device would have a higher setting producing more vapor compared to a mouth to lung draw (similar to how a cigarette would pull) which would require higher nicotine as less power is required producing less vapor. Ask your local vapor shop on the differences between a mouth to lung draw versus a direct lung draw to determine what's best for you. Also check out our blog on "What is Mouth to Lung vs Direct Lung Vaping" for more information. Please be advised for symptoms of nicotine overdoes. To avoid nicotine overdose, pick a sensible level of nicotine! As mentioned, start off low and test if your body needs a higher mg. Ensure you keep your puffs to the minimal and be aware if you start having headaches, nausea or dizziness, as they are common symptoms of nicotine overdose. If you experience any of such symptoms, discontinue use of all nicotine products and speak to your family physician immediately. Remember don’ take too many puffs in one session, especially with nicotine, as you may get light headed. It’s recommended to vape at lower voltage than 5 volts (preferably under 4.5volts), adjust voltage/wattage based on e juice flavour and regularly change your coils to keep your tank clean. Check out more commonly asked e liquid questions here.